Pascala is an exceptionally pretty little mare with very distinctive markings. She is an intelligent pony who likes to know what is going on and she has an inquisitive nature. Pascala has been lightly backed and we are now looking for a knowledgeable home where she can continue her education. We are looking for someone who has experience with bringing on green/young horses. Pascala has a maximum rider weight limit of 10 stone. 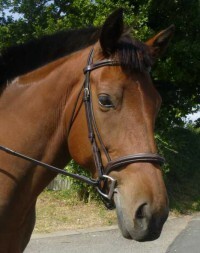 Pascala is a sweet natured pony who is easy to handle and generally polite.